A commissioned installed will transform the Museum of Modern Art in New York into a walk-in/walk-by movie theater. Artist Doug Aitken will be creating his first large-scale installation in the United States. And there’s no question it’s large-scale: the new MOMA has vast, hulking rectangular spaces on its exterior, a nod to the museum’s High Modernist past. It’s almost as though this museum were build for projection. Now the question is, just like the irreverant podcast “tours” of MOMA, I wonder if anyone is brave enough to photonbomb the installation with a counter-projection. The work will feature footage shot around New York leading up to the installation, and is presented by MOMA in conjunction with Creative Time. Aitken’s past work seems a perfect fit: he uses stark, human-focused urban imagery in installations that somehow manage to make the ubiquitous rectangle of projection art cool. 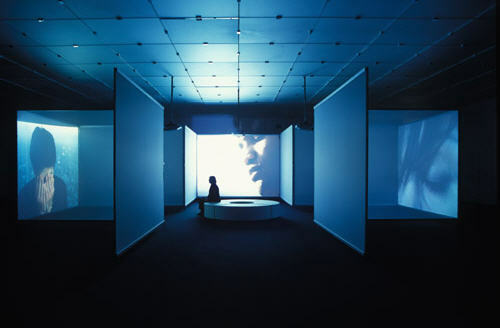 The installation pictured below is an interior from his Kunsthaus Bregenz installation. Creative Time, the presenting organization, is known for its New York installation work, including the Tribute in Light that memorialized the World Trade Center as two brilliant beams of light. 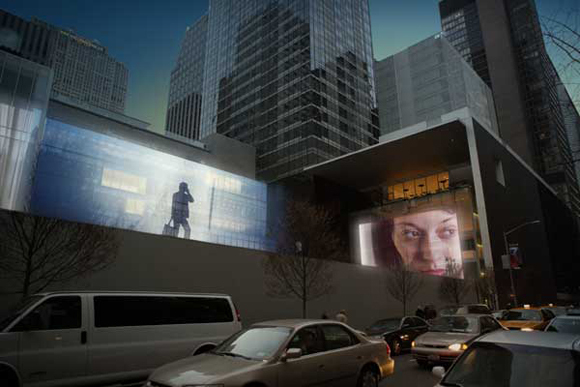 The new MOMA installation will incorporate drool-worthy digital projectors provided by Christie Digital Systems, Inc., a global provider of industry-class projection (and high on our “green with envy” list here at CDMotion). Check back in January ’07 when we get to see this in the flesh (or in the photons, anyway).